TheGlint: What the failure of the group home for idealists says about Silicon Valley. 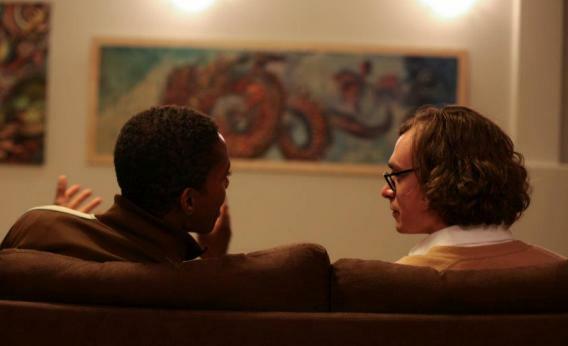 TheGlint resident Bjoern Herrmann, co-founder of Startup Genome, speaks with a party guest. What if you could live at TED? If you could have your morning coffee with the most galvanizing voices in technology, entertainment, and design, would you be more driven to do something great? Especially knowing you would have to report back to them when you got home for dinner? That was the idea behind TheGlint, a co-housing space in San Francisco’s Twin Peaks. “Our mission is to discover and create heroes,” co-founder Damian Madray, a designer wrote in a December blog post. Entrepreneur Charles Lee, philosopher Alexandros Pagidas and Madray wanted to foster a community that encouraged innovators to reach for more than just dollar signs. Over the eight months of its existence, TheGlint hosted close 100 residents. Residents included engineers, designers, entrepreneurs, artists, musicians, scientists. The four-story, seven-bedroom housed up to 16 at a time, including several Thiel Fellows, StartupGenome founders Bjoern Herrman and Max Marmer, and San Francisco DJ Teeko Shimon. Together, residents worked on multi-modal digital performance pieces, apps to aggregate and translate scientific research, and online networks for global leadership. The talks and art shows hosted at the house drew hundreds of people at a time, and every Thursday night, residents work-shopped pitches and ideas after dinner. But on Sept. 1, the house closed. Communal housing is a long-standing tradition for the Bay Area’s tech scene. NASA’s bohemians have Rainbow Mansion in Cupertino. Mountain View’s Tortuga is where sea-steaders (libertarian futurists dedicated to the creation of an independent city-state in international waters) host Singularity meet-ups. * Madray and Pagidas met at BlackBox in Atherton, an accelerator and residence for international entrepreneurs. But what made TheGlint special was that its mission verged on spiritual: finding work with purpose and purpose in work. This romanticism stands in contrast not only to the corporate culture that drives the “built to sell” startup mentality so reviled by residents, but also to the Valley’s incumbent religion of rationality. Unfortunately, even the savviest Glinters didn’t quite recognize the project’s virility, nor its magnitude. TheGlint’s failure could be attributed to a bug common to most viable startups: it drew too much traffic, too fast, and it crashed the servers. Which is more complicated when the “servers” in question are people—namely the founders. All three had start-ups of their own, and they never predicted their side project, which started because they wanted a cool place to live, would take off so quickly, nor incur such high costs. “None of us ever gave it our undivided attention,” Madray lamented in TheGlint’s farewell blog post. Residents paid the mansion’s full rent, which shot up as the parties grew larger and the neighbors turned ornery. Certain house members, Madray and Pagidas especially, found themselves bogged down with the details of maintaining a home—laundry, cleaning, groceries—on top of the organizational energy that went into managing public events. And then there was the matter of the house’s mission, as more and more people saw the house purely as a networking opportunity. Near the end, many of the newer-comers advocated adopting the for-profit model of a Y-Combinator-style accelerator. While the founders were open to ideas for making the house viable, this one in particular seemed to undermine their philosophy. The decision to end TheGlint was at the hands of the founders—they would rather the brand go dormant than allow a successor community, with different principles, to dilute it. *Correction, Sept. 18, 2012: This blog post originally cited the wrong locations for the group houses Rainbow Mansion and Tortuga. Rainbow Mansion is in Cupertino, not Palo Alto, and Tortuga is located in Mountain View, not Menlo Park.